the weather in 2018 and its effects on my flowers. Welcome to the web site of Waterman Gardens, home of Patti Waterman's "free-form" daylily introductions. Waterman Gardens is located in a creek valley in rural Osage County, Missouri, about 30 miles east of Jefferson City and a few miles south of the Missouri River. Growing conditions are good but challenging, as we get the first and last frosts of the season. Low temperatures in winter come early in the night and subject the plants to a harsher cold than our location would imply. Snow cover cannot be counted on for protection. We also get the heat that summer offers in the Midwest as well as strong winds that come with the numerous storms. Hybridizing in these conditions for the past 25 years has resulted in hardy plants that can thrive in a wide variety of conditions. All Waterman introductions are diploids. 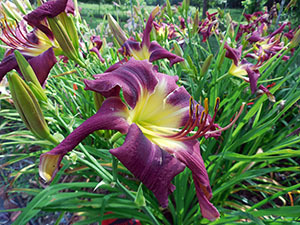 I specialize in Unusual Form daylilies, but continue working with the round ruffled forms. A fledgling doubles program is also in the works. I hope you enjoy viewing my introductions as well as some of my seedlings that are under evaluation. I am a member of the American Hemerocallis Society and would like to refer you to its web site at www.daylilies.org for further information about daylilies. A section there entitled "Dictionary of Daylily Terms" may help you understand any new daylily terms you encounter. Special pricing information is available from the hybridizer for collection and club orders.